I was lucky enough to have a bitzed model of Logan Grimnar sitting in my bitz box which I decided to use as a test model early on in this project. This would be my way of figuring out the colours, doing a fun conversion, and getting used to such a different force from what I've done before. I was lucky enough to get to work with the new cast of Njal Stormcaller. This model is well sculpted, and while it does suffer from the static pose syndrome, it feels appropriate for such a powerful psyker/wizard. I went for non-glowing runes because with the armour so pale, it wouldn't seem glowing so much as badly highlighted. Otherwise, wolf pelt as accurate as I could make fur, as with his red hair. Delicately gave him fangs, and did attempt to make his eyes look like they were glowing. The staff is somewhat plainly painted, but he had so little metal elsewhere I wanted to do some to balance. Here you can see the wolf pelt. Nothing does fur quite like drybrushing; it highlights the fur well, and makes the surface seem nice and furry as well. (By contrast, straight painting tends to make things look very smooth.) His raven was painted with a gloss black, and lightly drybrushed with grey, so the feathers seem very sheen. 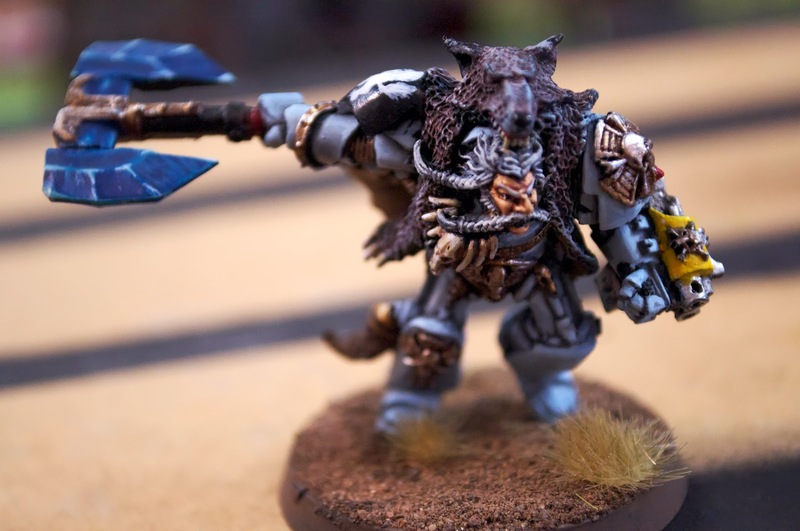 The Space Wolves love their lords, and I figured between Canis, Njal, and Logan we were well placed. 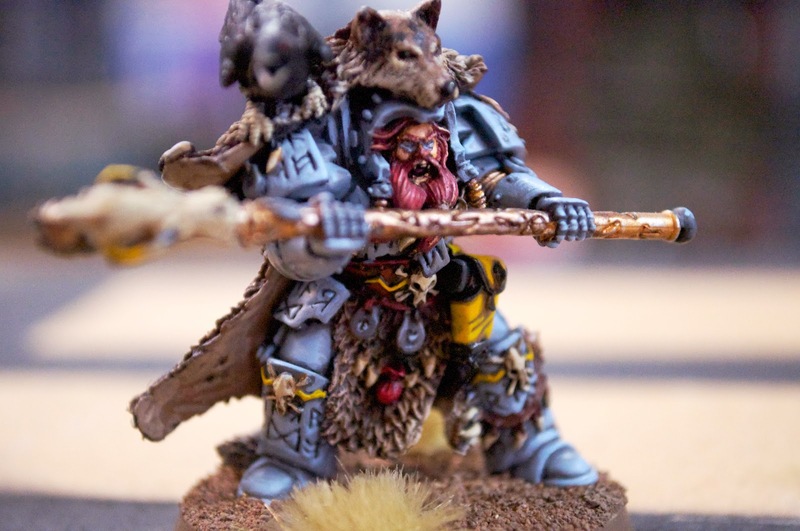 I would eventually have done a customized hero/lord to look like the store owner's son, who at the time had long-ish hair and a thick beard (Very Space Wolf-y), and perhaps one of him. I guess I may still, since I do still have the leftover bitz in my bin! 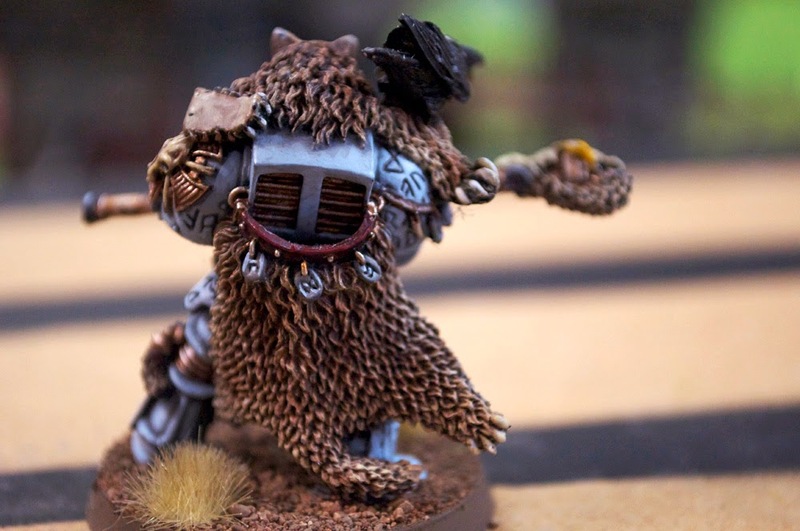 Where could I get one of these miniatures?